Mac DVD to FLV Converter to convert DVD to FLV and SWF on Mac. iMacsoft DVD to FLV Converter for Mac is a powerful Mac DVD to FLV Converter designed just for Mac OS X users. You can upload FLV video from DVD movie onto your Mac and share them with your cyber friends. It can allow you to rip and convert DVD to FLV streaming video and SWF video formats with super high speed! So you can convert your favorite DVD movies to FLV videos and then upload them to YouTube, Myspace and Google video in order to share the small converted flash video with your friends all over the world. 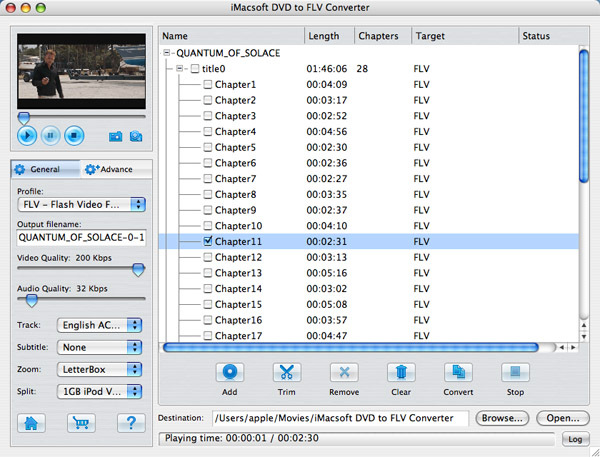 iMacsoft DVD to FLV Converter for Mac provides a series of powerful settings. It lets you customize file size, split output file, select audio track and subtitle, convert files in batches, and adjust video and audio parameters like bit rate, sample rate, resolution, frame rate, etc. Batch process and multithreading conversion can make you have an easy and fast way to get FLV videos easily. Now free download and try this powerful Mac DVD to FLV Converter and share the small converted flash video with your friends and family through internet. How to rip movie DVD to FLV videos for YouTube?